To ensure reliability, panel-mounted connectors should be installed with sealing accessories to withstand the harshest environments. 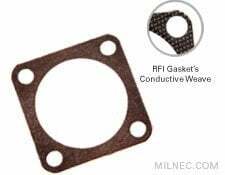 Milnec offers the best in gaskets for any interconnect application, from environmental neoprene gaskets to conductive EMI gaskets and fuel-resistant fluorosilicone. Gaskets are available in all shell sizes for current circular mil-spec connectors, including MIL-DTL-5015, MIL-DTL-26482, MIL-DTL-38999, MIL-DTL-83723, and MIL-DTL-22992 Class L.